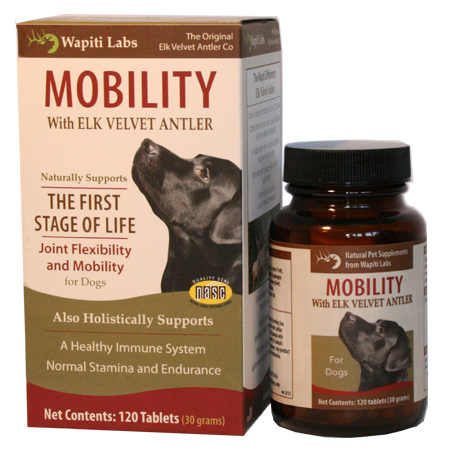 Strength Supplement for Dogs | Elk Velvet Antler | Wapiti Labs, Inc. Naturally helps keep dogs in peak condition. When your dog slows down or seems weak, you can restore warmth and re-establish strength in your companion with Strength formula for dogs. This concentrated liquid formula is a natural blend of Elk Velvet Antler and traditional herbs. Available in a concentrated liquid formula. There are no synthetic ingredients and crafted with proprietary processing. Made in the U.S.A. I work at an independent retail store where we sell these products. I’ve had my 3 year old pug on the Wapiti Labs Mobility for a couple of years and feel great giving it. However it wasn’t until he unexpectedly injured himself that I truly understood the power of these products. First, he broke his tooth right in half to the root and showed no signs of any discomfort, the vet couldn’t believe it- after thinking about it I credited his consistent use of elk velvet antler in his supplement. What else would prevent him from that horrible uncomfortable feeling that the vet told me should be knocking him out? Then he unexpectedly began limping. I did not see him endure any trauma and I couldn’t find the source or why he screamed when I picked him up or he stood wrong. I brought him the Wapiti Labs Strength and within ONE day I’ve noticed a massive improvement. I’m only on day 3 and already he’s back to his normal activities and is putting more pressure on his leg. These products are truly amazing and I continue to recommend it over any other supplement on the market! We started giving this awesome product to our older lab and we can not believe how well it is working for him. He has really improved and is jumping for his meals again.